Metsäkustannus is a multi-channel publishing house specialising in forestry. We are the leading provider of forestry information in Finland. Our business idea is to improve private forestry by publishing forestry information in various ways. The forestry journal called Metsälehti has been published since 1933. Its circulation is about 30 000 copies with 170 000 readers. The magazine format Metsälehti Makasiini was born in 1995. Metsälehti and Metsälehti Makasiini are a joint-magazine and together they are published 23 times per year. 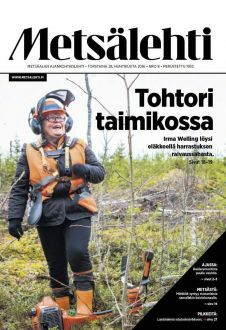 Metsälehti reaches practically all foresters and the majority of the active forest owners. We publish forestry news (Metsäuutiset) on our website every weekday. Also timber prices, job vacancies, forest estates, educational material and much more can be found on our website. Our discussion group and readers’ own forest-related images are very popular. Our website has more than 160 000 visitors per month. Metsäkustannus is also the main publisher of forestry books. We have about 50 titles relating to forestry.